So, summer’s in full swing, which means that hardly a weekend goes by when there isn’t a wedding to attend. And while I need a new dress as much as I need the new John Mayer album (or a hole in the head), I’ve still been stealing moments to window shop on Etsy. Because, you know, flirting with danger (and credit card debt) is always a good time. I had quite the internal debate yesterday trying to convince myself that the smocking in the back of this ultra-pretty, simple sundress would allow me to fit into this beauty. I wish. This one would be perfect for Jamie’s casual-ish farm wedding. 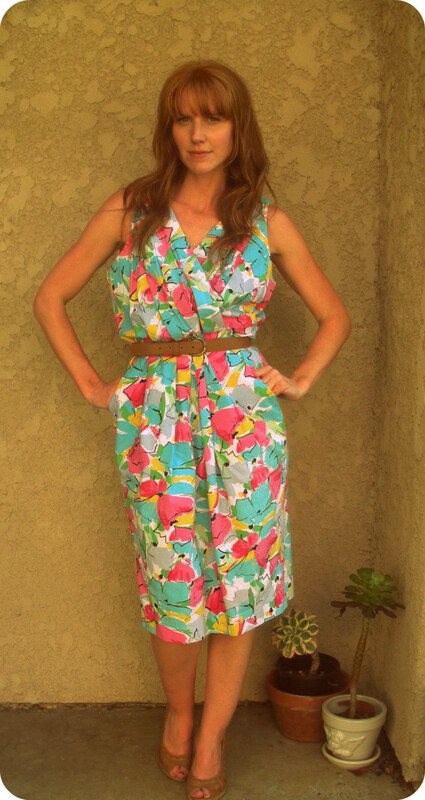 Vintage Turquoise Print Sundress, $26, from the Upside of Wonder. Amanda, the gal who runs this Etsy shop has a very pretty fashion/daily style blog. I’m a sucker for dresses with sassy backs, like this laced-up ’90s floral number. I love the wide boat-neck and lady-like length. 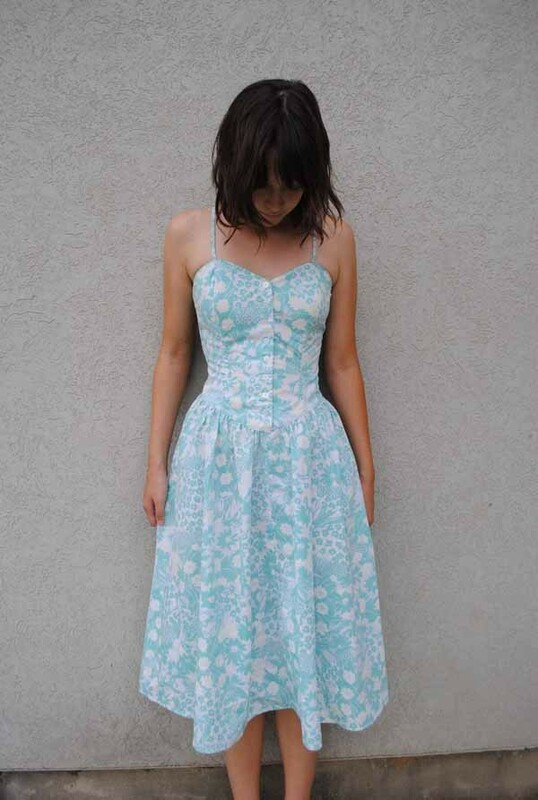 1970s Romantic Floral Lace-Up Dress, $52, from jessjamesjake. This dress looks comfortable, which is exactly what you want when you’ll be sitting, standing, eating and dancing in it for hours. I’m usually turned off by loud ’80s prints, but styling it with tan/light brown accessories, rather than stark black or white, tones the colors down nicely. This dress would be nice for the fancier, Friday night wedding I have coming up. 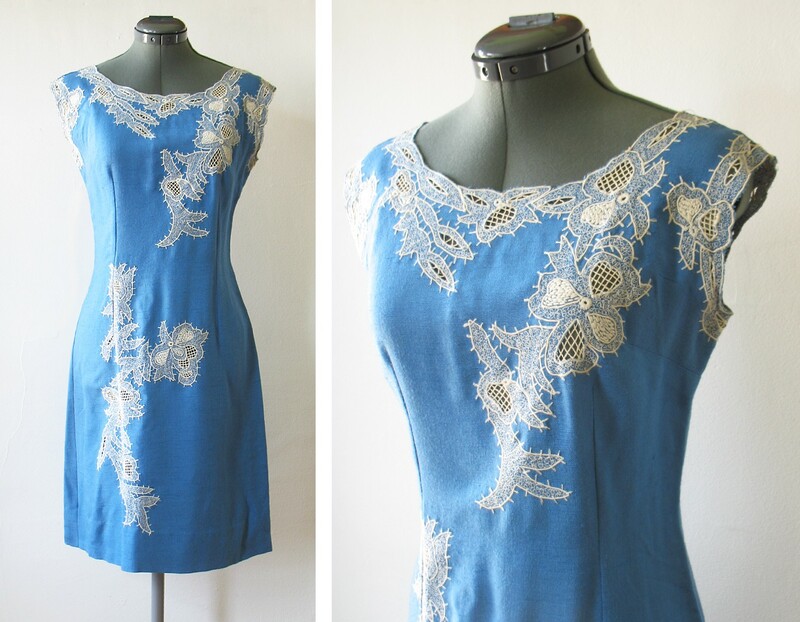 I love the lace insets and delicate embroidery details and stand-out blue color. Vintage ’60s Blue Linen Dress, $62, from Rust Belt Threads. The only non-vintage contender is this lovely bowed number. 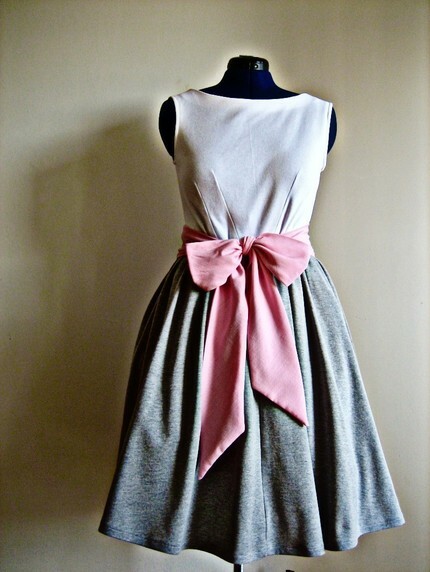 I have a soft spot for pink & grey, and again, this looks easy and comfortable. Coolidge Corner Dress, $128, from iviemade. I hope my willpower can hold up! This entry was posted in Uncategorized and tagged Etsy, good times, lust list by highplainsthrifter. Bookmark the permalink. That blue linen dress is gorgeous!